Today, the North Carolina State Quarter Coin remembers that not all the gold in 1849 was found in California. Yourself and the editors of the National Intelligencer, in copying an article about gold from a paper purporting, from the credit, to be published at Charlotte, (Quere Charlottesville?) Albemarle, Virginia, has labored under a mistake. The article was originally published in the Charlotte Journal of this place; and old Mecklenburg, North Carolina, is the county in which the gold was found-nearly ten pounds one afternoon, most of it in the virgin state, and several pounds (troy) subsequently from the same mine; and it is supposed that there are some two or three pounds yet in the ore surrounding the pocket from which the first was taken. It has to undergo burning, grinding, and separating, commonly called “washing,” before the amount can be ascertained of the remainder. There is no doubt, sir, that there is a great deal of gold yet in this region — much of a superior quality. Last year, from a tolerably careful calculation, there was something like half a million of dollars’ worth of gold raised in the surrounding counties; about three hundred and seventy thousand dollars was coined in the mint at this place, and about one hundred and thirty thousand dollars found its way North and elsewhere in bullion. Large amounts of gold have at various times been found in the mine now in question; and I would lay myself liable to the charge of gross exaggeration, if I were to tell the whole truth in regard to it. The gold in this mine is found generally in “pockets,” in a silicious or flint vein, over and under-laid with a blue slate formation. This mine belongs to Messrs. Wm. Elens and John Irving, of this place, and probably some one or two others not known to the writer. Major G. W. Caldwell and Captain J. Harrison, lately of the army, are principal holders of a lease of it. Several mines in the vicinity of this one are yielding very fair returns for the labor and capital invested. The most productive mine in this section is the Dunn Mine, in this county, owned and worked by Messrs. Wm. Elens and John Irving. So far they have found no end to the ore, which continues to be worth from $5 to $10 a bushel. The ore is principally decomposed silex, of a rich brown loamy appearance. In fine, sir, North Carolina probably holds out more inducements to emigrants and seekers of gold than California, for we have good wholesome laws, a peaceable population, and all or the necessaries of life in profusion, so that $1 will purchase as much here as $5 or $10 will in the vicinity of Feather river or the Sacramento, and the result of the purchase be far more pleasurably enjoyed under the protection of our good government. Charlotte, N. C. March 13. 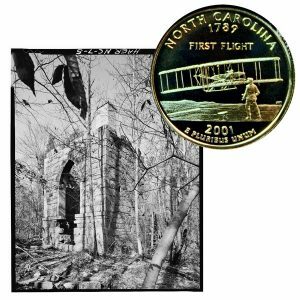 The North Carolina State Quarter Coin shows with an image, circa 1977, of the entrance to an old gold mining operation in the state.